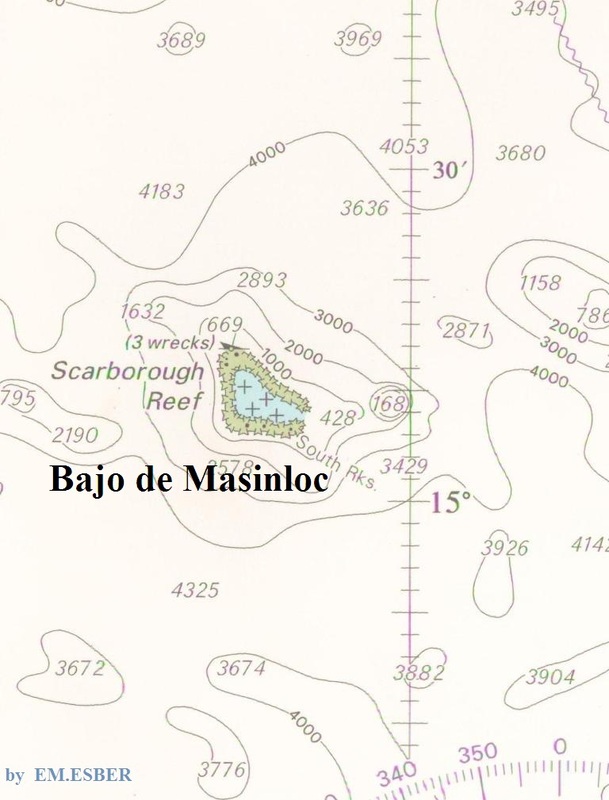 Bajo de Scarburo o de Masingloc (Scarborough Shoal). Source: Edgardo Angara, Jose Maria Cariño and Sonia Ner. 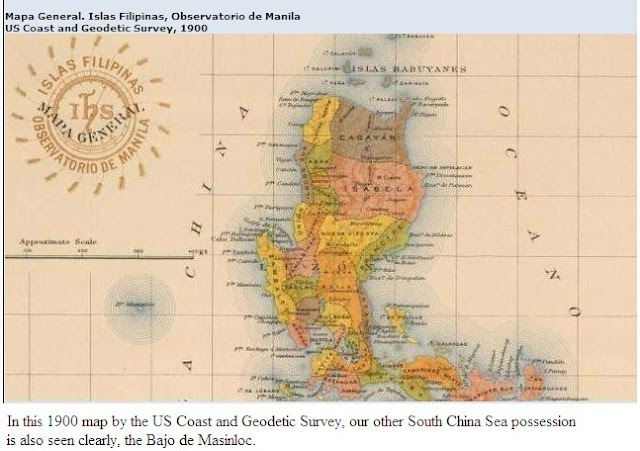 “Mapping the Philippines: The Spanish Period.” 2009. (François-Xavier Bonnet, a French geographer, is a research associate at the Research Institute on Contemporary Southeast Asia [Irasec]. Scarborough Shoal (Bajo de Masingloc and Panatag for the Philippines or Huangyan Island for China), located some 220 kilometers from the province of Zambales (Philippines), has been a bone of contention between the two countries since 1997. Scarborough is the largest atoll in the South China Sea [West Philippine Sea], submerged at high tide with few rocks above sea level, but was largely unheard of before the implementation of the United Nations Convention on the Law of the Sea (Unclos) in 1994. 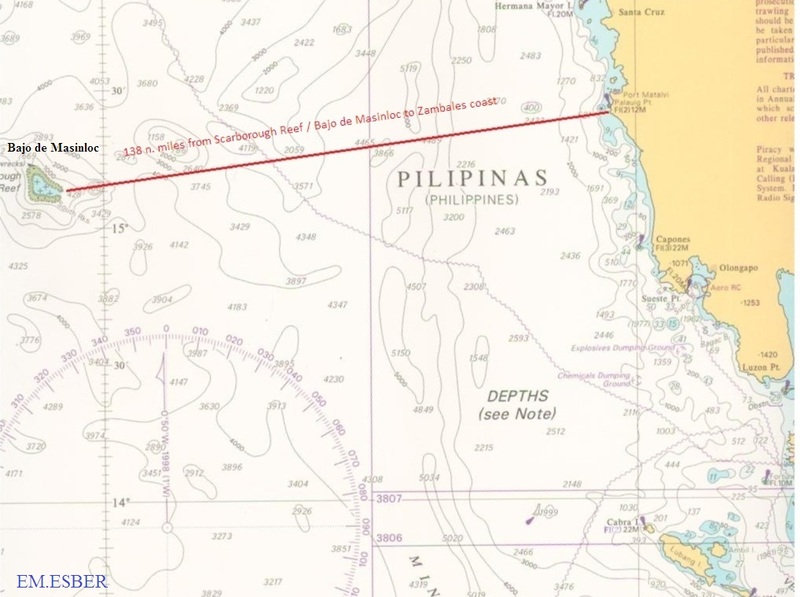 The shoal is inside the exclusive economic zone (EEZ) of the Philippines but is claimed by China as its ancestral territory since the Yuan dynasty (1271-1368). This conflict, recurrent year after year during the fishing season, worsened from April to July this year. This article focuses only on the geographical and historical links between the Philippines and the Scarborough Shoal. On Sept. 12, 1748, a British boat named Scarborough, carrying tea, was wrecked on a feature called Maroona by Spanish cartographers. Maroona Shoal became known internationally as Scarborough Shoal. 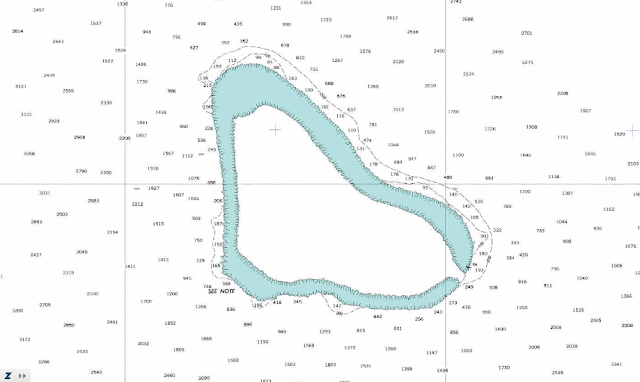 Maroona Shoal was first surveyed in April 1800 by a Spanish frigate, Santa Lucia, sent by Admiral Malaspina in Manila. under the direction of Ildefonso de Aragon, April 15, 1820. A more precise survey of this feature was organized in May of 1866 by the British vessel H.M.S. Swallow under the command of E. Wilde. However, with the island of Luzon being the closest to Bajo de Masingloc (124 nautical miles or 220 km), responsibility for rescuing vessels stranded at the shoal naturally fell on the Spanish Navy. Thus, according to the Spanish Hydrographic Office (1866), boats from the Philippines were sent to help crews in difficulty on this shoal. This responsibility was transferred to the American colonial government in the archipelago. For example, when, on May 8, 1913, the Swedish steamship Nippon went aground on Scarborough Shoal, the Bureau of Navigation in Manila sent the Coast Guard cutter Mindoro to help the stranded crew. Moreover, a conflict arose between the salvaging company and the insurance companies for the sharing of the proceeds of the salvaged cargo (copra). Litigants went to the Manila Court of First Instance and then to the Supreme Court of the Philippines. The final judgment of the Supreme Court was recognized by the claimants. The 19th century nautical books of the British Admiralty and the Spanish Hydrographic Office did not note the presence, on this shoal, of fishermen from China or elsewhere (unlike on the Spratly and Paracel Islands). The geographical proximity spoke in favor of the Philippines (rescue operations). In a way, Bajo de Masingloc could be seen as integrated in the sphere of influence of the Philippines, but outside the main archipelago. 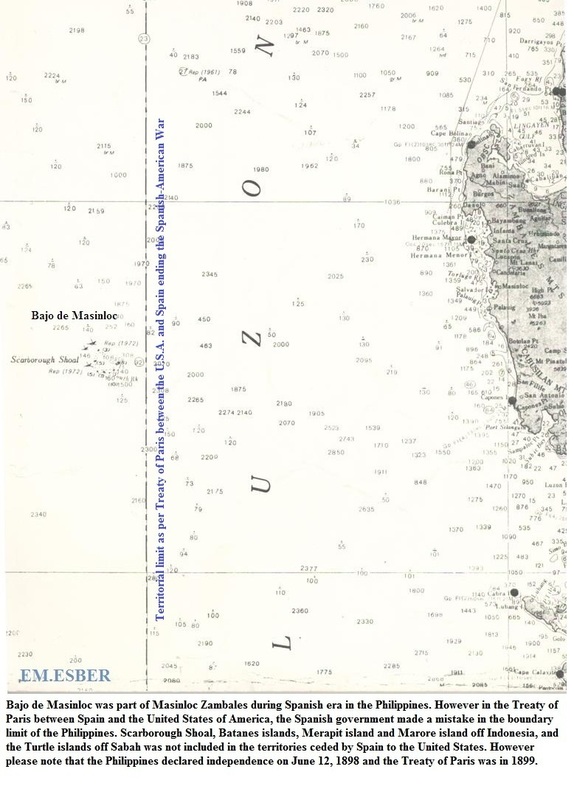 Political and symbolic acts, like naming the shoal, surveying, map-making and organizing rescue operations, were the only appropriate activities that the Spanish and American authorities could do on an isolated shoal, which was, for the most part, underwater during high tide. The main argument of the Chinese government and legal scholars is to consider the Philippine claim on Scarborough Shoal as extremely recent. According to their writings, the Philippine government claimed this shoal for the first time in 1997. Subscribers to this view contend that the atoll is outside the Treaty of Paris signed between Spain and the United States in December 1898, the Treaty of Washington between the United States and Spain on Nov. 7, 1900, and the Convention between Great Britain and the United States that was concluded on Jan. 2, 1930. So, the Philippines cannot reasonably claim it. However, in the context of the southern expansion of the Japanese empire and the preparation for independence, the Commonwealth of the Philippines claimed in 1937-38 the Scarborough Shoal. No less than President of the Commonwealth Manuel Quezon, US Secretary of State Cordell Hull and US Secretaries of War, Navy and Commerce concurred with this claim. As they recognized that the Scarborough Shoal was outside the limits of the Treaty of Paris, they considered these limits as flexible and not fixed boundaries. This flexibility could be shown by the fact that in 1900, the Philippines recovered some islands (Sibutu and Cagayan de Sulu) but lost the Island of Palmas in 1928 and gained the Turtle Islands and Mangsee Reef in 1930. Thus, the transfer of the shoal could be done, with enough Spanish evidence, by invoking the Treaty of Washington of 1900. Nevertheless, the bureaucratic process of the claim took nearly the whole year of 1938. In 1939, the Japanese Navy took control of Hainan Island and Paracel Islands, and was pushing toward the Spratly Islands. 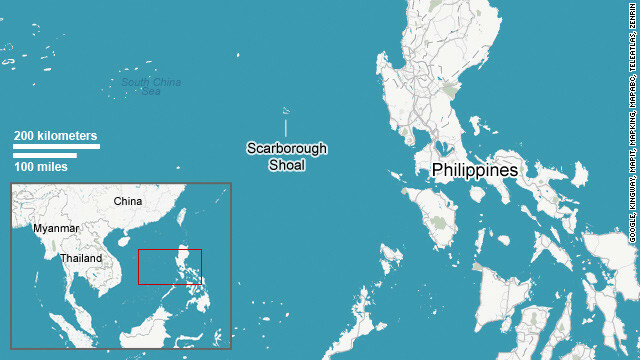 For security reasons, Scarborough Shoal was unofficially claimed. It is also for security reasons and not for historical reasons, that China claimed, unofficially, all the features in the South China Sea, among them, the Scarborough Shoal in 1935. Thus, before the Second World War, in the context of Japanese expansion, the Philippines and China made parallel claims to Scarborough Shoal, each without knowing that the other was doing the same. Both claims were unofficial in the sense that there was no notice to the whole world to avoid attracting the attention of the Japanese. Nevertheless, in the case of the Philippines, the State Department had more specific information about Scarborough Shoal than the Chinese had. For the Chinese government, Scarborough Shoal was simply one small feature among all the South China Sea islands and reefs. It had no information about this shoal but was expecting that in the future its researchers would find some evidence of Chinese ownership. In conclusion, the Chinese claim was as recent or as old as the one of the Philippines. From the end of the Second World War up to the 1990s, Scarborough Shoal was largely ignored by the governments of China and Taiwan. In some international conferences, the two Chinese governments would claim regularly that the Xisha, Zhongsha and Nansha islands were part of their territories, but no specific actions were taken concerning Scarborough Shoal. This shoal was too close to Subic Bay, the main American naval base in Asia. In the context of the Cold War, the main ally of the United States, Taiwan and the far away mainland China would not risk trying to take control of a mostly underwater reef. The first official mission on this shoal by Chinese authorities was made in 1978. In effect, that year, the Earthquake Bureau and Oceanic Administration made a survey of Scarborough Shoal. In 1983, the shoal was renamed Huangyan Qundao (Huangyan Islands). 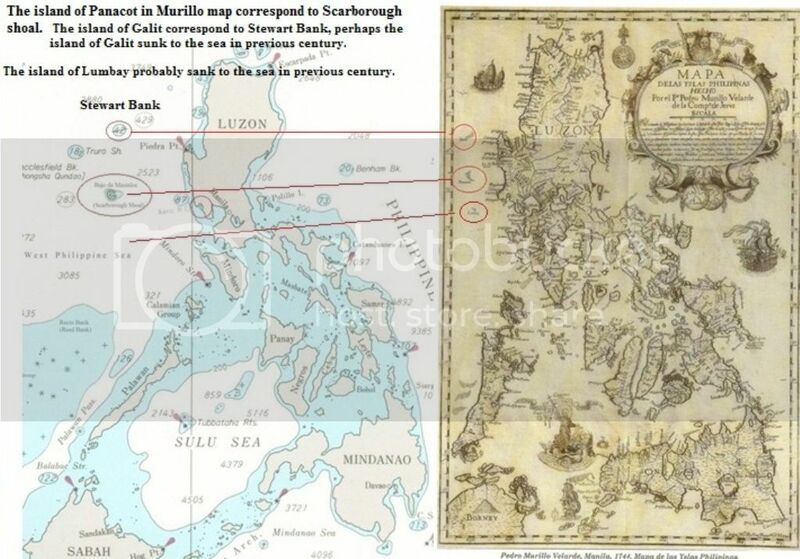 In the Philippines, the name of Scarborough Shoal appeared in the newspapers mostly in relation to smuggling activities of syndicates based in the province of Cavite and abroad. In October 1963, for example, the Philippine Navy discovered that the shoal was used as an entry point for smuggled goods (cigarettes, etc.) from Macau. The contraband was carried by Taiwanese fishermen. According to news reports, the international syndicate built two bodegas and some pier facilities on the shoal. Fishermen from the Philippines working for the Filipino side of this syndicate loaded goods on their boats and unloaded them on various beaches of Luzon. These well-organized international private activities were simply using loopholes of maritime laws of the time. The status of a shoal in the high seas was still not clear. The Philippine Navy arrested the Filipino fishermen (a Taiwanese boat was pursued by a Filipino boat but it was able to escape) and bombed, on orders of Defense Secretary Macario Peralta, the facilities built by the syndicate. This bombing followed an aerial mission by the Philippine Air Force over the shoal. It should be noted that these state activities (fighting smuggling and bombing the structures on the shoal) undertaken by the Philippine Navy were not protested by Taiwan or China. Another investigation in March 1964, under the Senate blue ribbon committee, confirmed once more these smuggling activities on the shoal. It is probably the reason that, following these investigations, a Filipino flag was raised on an 8.3-meter pole and that the government built in 1965 and operated a small lighthouse on Scarborough Shoal. Thus, the activities of the Filipinos on Scarborough Shoal in the 1960s went unchecked and were not protested by the two Chinas. Then on May 1, 1997, when Philippine Navy ships intercepted an international amateur radio team sponsored by China on Scarborough Shoal and later arrested 21 Chinese fishermen, the incident started the first confrontation between the two countries over the shoal. On the Chinese side, it was perceived as the first time the Philippines dared to challenge China’s sovereignty over the shoal. But, in light of what we said earlier, the Philippines could easily turn the argument against China. 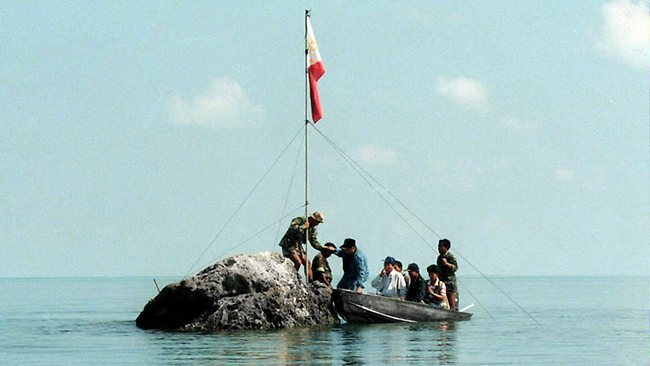 bearing Philippine flag in South China Sea in 1997. President Gloria Macapagal-Arroyo signed on March 10, 2009, the new law on the baselines (Republic Act No. 9522) declaring Scarborough Shoal outside the main archipelago but under the regime of islands. It was in conformity with Unclos and the historical links between the shoal and the Philippines. In fact, as we have seen, the shoal could be perceived as a special territory since the 19th century (under the sphere of influence of the Philippines) and confirmed as such by its exclusion from the different baseline laws of 1961, 1968 and 2009. The various State activities on the shoal, like organizing rescue operations, fighting smuggling activities, building a lighthouse, or more recently arresting poachers, are consistent with the nature of a low-tide elevation and its isolation from the main archipelago, and with the sovereign rights of the State in its EEZ. The Chinese government has criticized the Philippine position as inconsistent with the Constitutions of 1935, 1973 and 1987, as they refer to the Philippine territory through the colonial treaties, excluding de facto the shoal. However, first, neither of the postcolonial constitutions referred to the different treaties signed by the American from 1898 to 1930. No details were given on the geographical coordinates of the archipelago. Can the United States be dragged into the Sino-Philippine dispute over Scarborough Shoal? The United States has repeatedly said it does not take sides in these territorial disputes but enjoined the claimants to resolve their differences peacefully in accordance with international law and freedom of navigation. on the armed forces, public vessels, or aircraft of the Philippines (or the United States) in the Pacific Ocean. If we apply the MDT to the case of Scarborough Shoal, several remarks can be made. 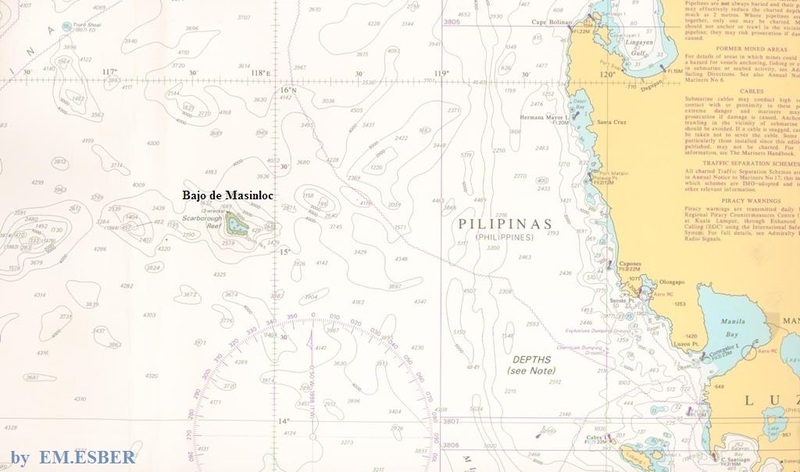 Since the promulgation of the 2009 baseline law, the Philippine government clearly does not consider the shoal part of its metropolitan territory. 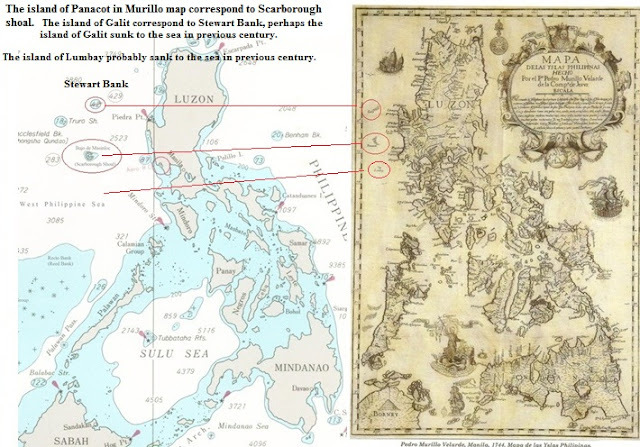 However, as we have seen, the claim over Scarborough Shoal was made some 13 years before the signing of the MDT. Moreover, an attack on any public boat of the Philippines patrolling around the shoal could prompt the decision to invoke the MDT. The United States and the Philippines can develop a “strategic ambiguity” on the possible use of the treaty.